The Alta Mons low ropes course is designed to push groups to experience leadership and team building in a safe outdoors environment. Our trained facilitators will guide your group, step-by-step, through our 12 element course. You'll start by warming up to one another and your facilitator because trust is a huge part of the leadership process. Then, your group will move through the course gaining leadership skills at each stop. Is your small group interested in learning about nature, fire building, or orienteering? Do you want your college students to learn leadership skills they can take with them anywhere? Are you a retreat leader trying to perfect your retreat plans? 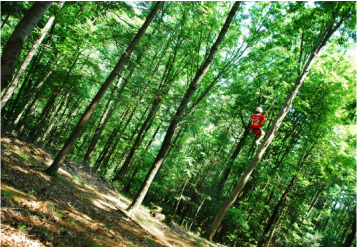 Have questions about high and low ropes? Contact Meredith Simmons at 540-268-2409 or office@altamons.org to get all your questions answered! Experience the thrill of flying freely through the air! Have a blast laughing with friends and family. The Alta Mons high ropes course will pushing you beyond your comfort zone while also giving your group time to relax and get away. Alta Mons currently has 8 high ropes challenge elements, 3 in trees and 5 on poles. Our Tri-Challenge element incorporates 3 different elements 30 feet above the ground; the Multi-Vine, Catwalk, and Zipline. While on a belay system, you walk along a cable called the Multi-Vine using dangling ropes, you cross from one tree to the next, then edge along a telephone pole known as the Catwalk to our Zipline platform where you end by zipping through a canopy of trees. Our brand new pole course consists of: a Two-Line Bridge, Dual-Belay Catwalk, Dual-Belay Lily Pads, a Swing Shot, and a Flying Squirrel. Make sure to mark your calendars for Saturday August 24, 2019-- the high ropes course will be open to the public for FREE because Alta Mons will be having our 6th Annual District Cookout! See you there!